Prime Minister Malcolm Turnbull has called the attack "vile" and "horrific"
BRITISH authorities have confirmed the man involved in the Manchester attacks died inside the Manchester Arena and was wearing an improvised explosive device as he carried out his apparent suicide mission. Chief Constable Ian Hopkins said in a press conference the attack was conducted by one man, and were working on determining whether the attacker was "acting alone or as part of a network". "The attacker, I can confirm, died at the arena. We believe the attacker was carrying an improvised explosive device, which he detonated, causing this atrocity," Constable Hopkins said. "It's a fast moving investigation, we're saying it was an improvised explosive device." Moment explosion happened in Manchester: Vision from inside arena as loud explosion is heard. The United Kingdom is waking to the devatasting news that 22 people are dead and almost 60 are injured after a terrifying, tragic incident in Manchester overnight. The death toll rose from 19 to 22 as police confirmed young children were among the victims. "This will be a fast moving investigation, with significant resources deployed." Horrifying witness accounts are starting to emerge after an explosion at an Ariana Grande concert in the UK left 22 people dead and injured about 59 others. Police say the incident at Manchester Arena in northwest England was being treated as a terrorist attack. Explosion captured on dashcam: Dashcam captures rumble at Manchester arena. The attack, by a suspected suicide bomber, left terrified concert goers scrambling to safety as others - some injured and covered in blood - were helped from the stadium. Despite authorities not giving a clear indication of what exactly was used in the attack, witnesses and fans have reported wounds consistent with a pressure-cooker bomb. So gruesome was the aftermath, body parts were reportedly scattered around the scene. Greater Manchester Police Chief Constable Ian Hopkins said at least 19 people had died during the explosion which occurred just as Grande was finishing her concert. He said about 50 people were injured and were being treated at six hospitals across Greater Manchester. The North West Ambulance Services NHS Trust has since tweeted that 59 casualties were being treated, along with a number of "walking wounded" on the scene. Chief Constable Hopkins said police were working closely with the national counter-terrorism policing network and UK intelligence partners. "This is clearly a very concerning time for everyone," he said. It's feared many of the victims were young girls who had attended the popular pop star's concert. Hours after the incident Grande tweeted an emotional message: "Broken. from the bottom of my heart, I am so so sorry. I don't have the words". TMZ is reporting Grande is "inconsolable" and "in hysterics" after learning of the deaths, and has indefinitely suspended her world tour. Eyewitnesses described a terrifying scene that began after the suspected nail bomb tore through the stadium, with nuts, bolts and nails reportedly cutting through the crowd. Video shows scared young people trying desperately to escape the 21,000 capacity stadium after the explosion rang out. Prime Minister Malcolm Turnbull said Australia's heartfelt sympathy and resolute solidarity was with the people of the United Kingdom. "This attack is especially vile, especially criminal, especially horrific because it appears to have been deliberately directed at teenagers," Mr Turnbull said. "This is an attack on innocence. Surely there is no crime more reprehensible than the murder of children. This is a direct and brutal attack on young people everywhere, on freedom everywhere." Turnbull: "Vile, horrific" attack: Prime Minister addresses Parliament about Manchester attack. Mr Turnbull said the Australian High Commission was making inquiries to determine if any Australians were caught up in the attack. He said the federal government also continued to work with other state and overseas authorities to develop its national strategy for protecting public places. "We have seen too many crimes perpetrated by acts of violence and terrorism in places of mass gathering, not to realise that we need to do more to keep our public places safe," Mr Turnbull said. "It is a very, very high priority." Speaking to BBC Radio in Manchester, a woman identified only as Emma described in graphic detail the gory and terrifying scene inside the concert stadium. She said there were "body parts everywhere". "It was definitely a bomb the whole building shook. Body parts were everywhere, a torso, an ear. It was the worst thing I have ever seen. Bodies were everywhere." She said the noise of the blast left her ears ringing. There was glass "everywhere" and she couldn't believe she survived. "I can't get the picture of those bodies out of my head," she said. A Western law enforcement official has told CNN that a male at the scene has been identified as the probable suicide bomber. There are also reports a nail bomb may have been used. A BBC reporter said one witness saw bolts on the ground, while a US law enforcement source told CBS that two explosions at the arena contained nails. Anxious parents have described scenes of panic and flying shrapnel as they waited to pick up their children. Gary Walker, from the nearby city of Leeds, has told the BBC he was injured by shrapnel as the explosion went off a few metres away while he and his wife waited for their daughters to emerge from the concert. "We heard the last song go and then suddenly there was a massive flash and then a bang and smoke. I felt a pain in my foot and my leg," Walker said. "I turned around to my wife, who was standing at the side of me, and she said, 'I need to lay down.' She's got a stomach wound and possible a broken leg," he said. "I've got a bit of a hole in my foot where I've got a bit of shrapnel. I was surprised I got away so lightly." Walker said he saw metal nuts that he believed could have come from an explosive device. Tables at the venue were being used as makeshift stretchers for the injured, he said. Islamic State have not yet officially claimed responsibility for the attack but American based terrorism analyst and data collector Michael S Smith II noted Islamic State-linked Telegram channels had been celebrating the Manchester attack. The suspected attack comes four years to the day that British Army soldier Lee Rigby was rammed with a car and brutally hacked to death in London, and just two months after the latest attack carried out by Khalid Masood. If Manchester explosion is a terrorist attack, it will be the most deadly since the 2005 London bombings that targeted underground trains and a bus, killing 52 people. British Prime Minister Teresa May said her thoughts were with the victims and families. "We are working to establish the full details of what is being treated by the police as an appalling terrorist attack," May said. Home Secretary Amber Rudd said her thoughts were with all those affected by "this barbaric act". ariana Grande performs at Manchester: Singer performs hit song at concert before arena explosion. Panicked families have taken to social media to try and find their loved-ones who had attended the concert. Meanwhile British locals and hotels have opened up their doors to concertgoers fleeing the attack, using the hashtag #RoomforManchester. Police said they were called to the scene just before 10.35pm on Monday (7.35am AEST Tuesday) and were responding to reports of an explosion at the arena, which can hold 21,000 people. Manchester Transport Police said in a statement there were reports of an explosion "within the foyer area of the stadium". 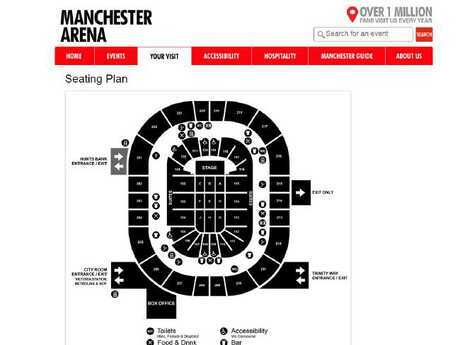 But Manchester Arena tweeted saying the incident "took place outside the venue in a public space". Police also conducted a controlled explosion at the nearby Cathedral gardens but the suspicious item turned out to be "abandoned clothing". Witnesses on social media have reported hearing a "massive bang" minutes after Grande finished her set, sending screaming crowds rushing out of venue. According to Sky News Home Affairs Correspondent Mark White, one witness said they were in the ticket hall area of the arena when the explosion "shot them up into the air a number of feet". "That person then said that they saw many injured in that area. British Transport Police say they're responding to reports of an explosion in the main foyer," White said. Robert Tempkin, 22, told the BBC: "Everyone was screaming and running, there were coats and people's phones on the floor. People just dropped everything." One Twitter user reported seeing "loads of kids and little girls" lying on the floor of a corridor. Staff at the Manchester Royal Infirmary have told local media "small children" were among the injured. Ambulances could be seen speeding into the children's emergency department. Karen Ford, who was at the concert with her daughter, told BBC it was chaos. "The problem was a lot of children were there without parents. There was no one to calm them down so everybody was just screaming and crying and pushing," she said. "There wasn't any smoke, there wasn't a flash, it literally was just a huge sound. "My husband heard a second one outside. "As we came out of the stairwell there wasn't a steward to be seen ... it was just chaos." But another woman Erin McDougle, 20, from Newcastle told The Guardian in the UK, "there was a lot of smoke". "People started running out. When we got outside the arena there were dozens of police vans and quite a few ambulances." Concertgoer and resident of Bury in Greater Manchester, Sibion Joyce, 22, told news.com.au she thought there had been two explosions. "There was an explosion heard as we were leaving the arena and then another one when we got outside," she said. "Everyone went still at first and then the panic kicked in and people started running and screaming to get out of the arena, there were lots of young people. "I was trying to get home from Manchester for two hours, there is a three mile radius cordoned off." One young man said Grande had just gone behind the curtain when there was a massive bang and "a big cloud of smoke". 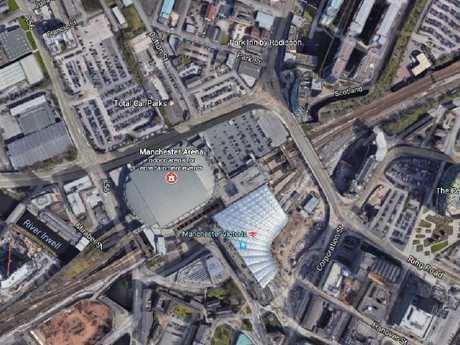 It's believed a bomb disposal unit and police sniffer dogs are on the scene, and the nearby Manchester Victoria train station has been evacuated. There was early speculation the blast may have been a balloon popping but witnesses said the noise was too loud. "It was way too loud and obviously with Manchester police saying that people have died now and people are injured on the way to hospital, then obviously it confirms it wasn't a balloon," Chris told Today. Concertgoer Harry Johnson said an explosion happened just after the show finished. "People were starting to make their way out of the arena, there was then an explosion, a moment of silence and people started shouting 'get down' and running and screaming," he told Today. "It was just a really, really, loud bang, it was terrifying. "There was screaming, running, people getting down, pushing, there were guards shouting to get out, I've heard reports of people shouting there was a man with a gun, but I'm not sure if that's true or not." Another concertgoer Lily also described the blast as "extremely loud". "People were just telling us to either get down, there was so much panic and confusion, that we didn't know what to do at the time," she said. "The concert had just finished. And all the lights had been turned back on. People were gradually starting to make their way out and then the explosion was heard. "I didn't see anything. But I've heard people saying that they saw smoke and a few people claiming that they saw explosions. But I can't confirm that." Witnesses have reported seeing emergency services swarming at the scene as video footage shows crowds rushing from the scene. One Twitter user said: "Everyone screamed and ran out I've never been so scared in my life." 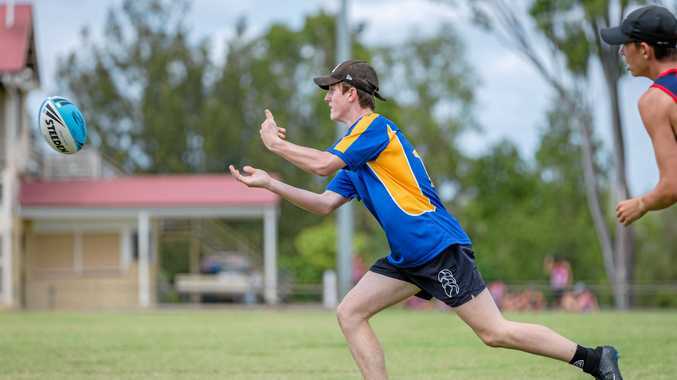 News The Gympie Devils under-18s are taking a page out of the 2018 A-grade book. News Stats come after elderly man lost a lot of blood in Noosa attack.